On any given day in Talkeetna, it is not hard to find a surprising number of people who are now Talkeetna residents, who spent their first summer and sometimes their first winter in a collection of wall tents six or seven years ago. The fact that what is now Talkeetna Hideaway was the entry housing for many locals speaks volumes about the value of accessible housing in rural communities. Our commitment to provide a quality living experience for everyone who stays with us is as true today as it was many years ago. It all started in 1996, when the Talkeetna Roadhouse recognized the need for housing for their summer staff. A plot of land close to downtown Talkeetna was secured. Then six wall tents and a bath house were constructed. In 2002, under new management, the property grew in size and number of structures. Trapper Cabins and Cuda Cabins were framed and finished on site to diversify the housing options and to meet increased need for seasonal housing. At the completion of Summer 2003, we built the Guest House which is open year round for overnight hostel-style accommodation. Talkeetna is located 114 road miles North of Anchorage. The trip is a direct and easy one as there are few highways in Alaska: AK-1 N to AK-3 N, turning on to Talkeetna Spur Rd. If you don't have a personal vehicle - there are several transportation alternatives. After the Spring 'Break Up', where major fields of ice melt under the coming Alaska Summer sun, the Alaska Railroad begins passenger service north from Anchorage. It leaves Anchorage daily at 8:15 AM and arrives in Talkeetna at 11:25 AM. If you plan on arriving by train, contact us and we will arrange a car for you and your luggage to be transported to your cabin. Talkeetna Taxi service will pick you up in Anchorage and drop you off at our door. 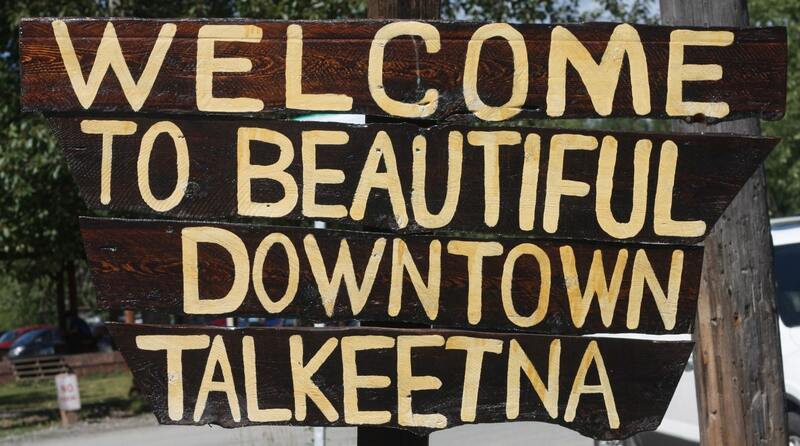 Once in Talkeetna you can ask anyone where the Talkeetna Hideaway is. We are conveniently located on the east side of town, east of the the Alaska Railroad tracks, at the corner of H Street and Gliska Street.